As crafters we buy a lot of stuff...well at least I do (zip it hubby)! Stuff that we either love and can't live without. Stuff that we like, look at, and think we will use someday (zip). Stuff we don't like (in some cases "yet") and horde or give away (ZIP IT PLEASE!). And, sometimes we buy stuff we already had...just did that a few weeks ago...oops! I don't know why I don't use up every single bit of everything before I buy more, or at least stick with a certain genre of art for awhile before moving on with another. I think I have a craft product sickness...or as some (hubby) would call it crap product sickness, i.e. "crap-booking". I probably need a 12 step program, but it would have to involve inking, painting, gluing, and cutting homework before I would even sign up. I have brilliantly managed to fit most of it in a 7 x 7 foot space...until somebody (hubby) builds me an awesome studio. Anyway, here is my list of all my favorite products from this year, and even though some have been around longer, I only started using them this year. I really do have issues! Please tell me I'm not the only one! Leave a comment and let me know your favs for this year as well! And, before anyone asks, no, I did not get paid to advertise for any of this. They are just my favorites and my opinion. Happy New Year's Eve everyone! I hope your hands get creatively dirty soon! There is not enough room to list my favorites!!! I have that sickness!!! Do you think it is contagious and if so, I am hoping they never ever find a cure! Want to know what my SA Hubby says? He can't retire until Tim does!!! Happy New Year! 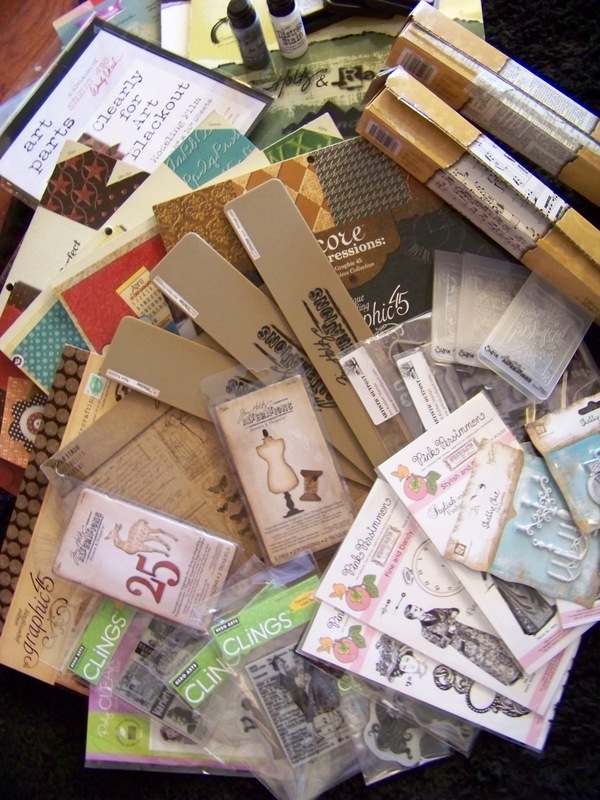 Looks like you picked up some wonderful crafty goodies this past year! Have a creative 2012! Love your top "10" - or is it top 40 - laughing all the way.....ho ho ho - sing along now! Have a very happy new year. Good thing that possible New Year's resolution to STOP FINDING LISTS OF SUPPLIES/MATERIALS TO COPY AND PASTE ONTO MY WISH LIST didn't make the final cut for 2012 resolutions. I would've already broken it, and it's just January 1!! Thanks for the chuckles... and yes, I slowly raise my hand to say "Me, too" on the duplicate purchases. That's never fun. But it just shows how much you liked it to begin with! Love your list! I have a lot of what you listed, but haven't tried the TH tissue paper yet. It's on my shopping list! I have to add Ranger's new colors of Archival ink pads and CTMH's Art Philosophy Cricut Cart to my favorites list. And a huge Congrats on winning on Tim's blog! What an awesome prize...and that's a shopping spree that your dh shouldn't groan about...lol! What great products! And how wonderful that your were chosen by Tim! Have a wonderful new year. My craft tools have now taken over my collection of kitchen tools........and they also collect dust as i don't play with them often enough. Just like you if it's new i want it!!!! so keep on sista! just found your blog but it's in my favs now!!! Defo not the only one :) Congrats on your win! I just discovered the distress stains and love them as well. Picket fence? Awesommmmmmmme.